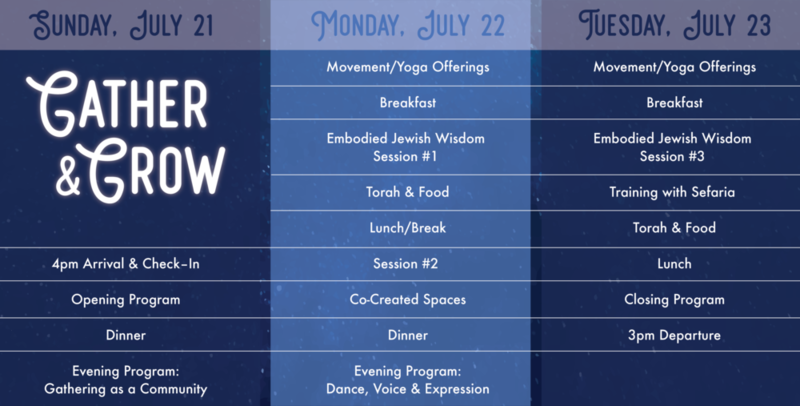 Are you a teacher of movement and yoga in Jewish contexts? Do you wonder how to strengthen your already amazing offerings? Or do you wonder where to begin when designing a class or workshop? Do you want to learn new teaching methods? Do you want to meet and create community with other like-minded practitioners and teachers? Join us for our first ever West Coast Convening & Training, a 3-day immersive retreat in Northern California with other teachers from all over the world for learning, sharing, skill-building, co-creation of new experiences, and envisioning of our joint future! Julie Emden, E-RYT-500, Halprin Practitioner, infuses her work with exploration, spirit and joy. She is passionate about awakening the body as a gateway to deep inner knowing and guides others in somatic explorations of Jewish wisdom teachings as a resource for living in balance and wholeness. A graduate of five fellowship and teaching certification programs related to her work as a Jewish educator, Iyengar-based yoga instructor and movement/expressive artist, Julie has two decades of experience guiding others in exploring Jewish wisdom, text and practices via the body in a variety of settings. Julie offers classes, workshops, on-line learning, retreats, teacher trainings, individual coaching, and strategic consultation and guidance for Jewish Wellness Initiatives throughout the San Francisco Bay Area. Kohenet Aliza Rivka is a dance alchemist and Kohenet Hebrew priestess, dancing with you toward the life you desire. She weaves her training as a Board Certified Dance/Movement Therapist, Kohenet: Hebrew Priestess and lifelong dancer to create transformative movement experiences that honor the soul's truth through the body's language. Based in the San Francisco Bay Area, Rabbi Diane Elliot is a teacher, ritual leader, and spiritual director who inspires her students to become clearer channels for Presence through awareness and movement practices, chant, and nuanced interpretations of Jewish sacred text. Before beginning her rabbinic training at the Academy for Jewish Religion, California in 2000, she performed and taught modern and improvisational dance and trained intensively in multiple somatic modalities. She is a Certified Teacher and Practitioner of Body-Mind Centering®, a Registered Somatic Movement Therapist, and has maintained a private practice for more than 30 years. From 2011–2018 Rabbi Diane directed ALEPH’s Embodying Spirit, En-spiriting Body movement-based Jewish leadership trainings. She is currently on the stewardship team for the Taproot Gathering (https://www.commonweal.org/program/c3/taproot/) and continues to lead retreats and trainings nationally. Learn more about Diane at www.whollypresent.org. Nancy Wolfson-Moche CHHC RYT-200, seeks to empower people to listen to their bodies through yoga, mindful cooking and eating, and other embodied practices. The founder of you are because you eat, Nancy counsels and teaches health, wellness and life skills to students of all ages through culinary medicine and sacred culinary arts. She weaves Torah, Jewish ritual, holidays and earth-based practices into a celebration of food and eating, inviting students to reimagine self-nourishment as an expression of spiritual connection and as a pathway to strengthening health and well-being. A former editor and writer on lifestyle magazines, Nancy’s articles have appeared in scores of magazines and newspapers. She is an emerging Kohenet. For more about Nancy visit youarebecauseyoueat.com. Miriam Raziel Kanani is a soulful singer/songwriter who blends reggae, jazz, and middle eastern compositions with spiritual lyrics that resonate with depth and truth. Her music has been described as rootsy, powerful, and hauntingly beautiful. Miriam has performed her music in New York City, the Bay Area, Israel, Florida, and in the midwest. Miriam has performed with the band "Kirtan Rabbi" (www.kirtanrabbi.com) and other bands over the course of several years. Miriam lives in Berkeley, California with her husband Babak and daughter Ariyah and loves integrating her music and Jewish teachings into all realms of her life. Mia Zimman is a Jewish Educator, Spiritual Director, and Facilitator of Lifecycle rituals. She regularly leads Shabbat and holiday services, retreats in Jewish Spirituality, kids and family programs, and Interfaith dialogue & events. Mia is a lead Educator for Camp Tawonga’s B’nai Mitzvah Program in San Francisco and works throughout the Bay Area as a guide for children in their coming of age journey for their B’nai Mitzvah. She received certification as a Jewish spiritual director through the Aleph alliance for Jewish renewal. Mia enjoys gardening, hiking, Yoga, and cooking. She lives in Petaluma, CA with her husband Alejandro. If, after purchasing, you are unable to come to the convening, please let us know. If we have a waiting list, we will be happy to refund your ticket minus a $75 cancellation fee. If we do not have a waiting list, you will be responsible for selling your ticket to someone else. Registration fees include all meals, a two-night stay at beautiful Westerbeke Ranch, and access to all sessions and activities. Accommodations are shared in gorgeous light-filled redwood cabins with 2-4 people per room. The vegetarian meals are hand-made, locally sourced, and delicious. The grounds offer sweet gathering spots, a lush garden, meadows, ponds, walking, hiking and resting areas, a hot tub, labyrinth, and you can book a massage on-site (at your own expense) if you’d like! If you need a scholarship, please complete this application and submit a deposit by May 31. Make it possible for others to attend with a tax-deductible donation. We will set up a ride-sharing sheet for rides to/from SFO and Oakland Airports and other Bay Area locations. Thanks to generous foundation and donor support, Embodied Jewish Learning is able to offer a limited amount of financial assistance to help make it possible for you to attend. Applications for scholarship assistance are due by May 31 and participants will be notified of funding by June 6. Support will be offered on a first-come, first-served basis, and the application must be accompanied by a Deposit Ticket, which will be refunded (minus a $20 administrative website purchasing fee) if aid is not awarded. Sfat Emet, the 19th century chassidic Rebbe from Ger, Poland taught that the words of Torah are engraved in the body of a person but are hidden and need to be discovered. Through the study of Torah and practice of Yoga we uncover the Torah that is engraved in our body, mind, heart and soul. A Torah Yoga practice, as well as basic tenets and ideas for teaching Torah Yoga will be offered by Diane Bloomfield in this experiential session. Rabbi Diane Elliot has spent the past 20 years integrating movement and somatic wisdom with more traditional approaches to Jewish prayer, ritual, mysticism, and sacred text. In this session she will share some of her methodology—which includes somatic exploration, improvisational dance, and Authentic Movement—through offering guided experiences of prayer and Torah learning. The session will include time for verbal reflections and questions. Join Julie Emden for an experience of Torah on all levels of being - mind, body, heart and soul. Learn basic principles for designing classes infused with somatic references and kinesthetic qualities as they relate to text from Torah via Embodied Pardes, a unique methodology for Torah study based upon the traditional Pardes model through a kinesthetic lens, offered in Julie’s Embodied Jewish Wisdom Teacher Training. This approach is applicable to all styles of yoga, dance or movement. Join Kohenet Aliza Rivka for an ecstatic dance journey honoring the body as temple. Through sacred movement tools and a soundscape designed to awaken your deepest dance, embody a paradigm of play, pleasure and possibility. Experience your presence, your voice, your unique expression as an essential part of this circle of teachers, and of the great circle dance of humanity. Remember that your felt sense is worth following. This convening is made possible with support from Lippman Kanfer Foundation for Living Torah, and we are still looking for additional sponsors to help make all desired aspects of this project come to fruition! Please be in touch with Julie if you would like to make a gift or refer other supporters to help manifest this vision!